The internet is still being spammed with emails trying to claim that Barack Obama is not a natural born citizen and therefore ineligible to be President. I think that the reason so many people are starting to buy in this is a reflection in the total disappointment many people who supported Obama are feeling as he fails everyone of his campaign promises and seems intent on being Bush-light. Currently Obama's polls are in Bush country! Currently, there are two new birth certificates in play, both claiming to prove that Obama was born in Kenya. The above is already acknowledged to be a fake, mostly because genuine birth certificates from the colony of Kenya included the babies footprint on them. 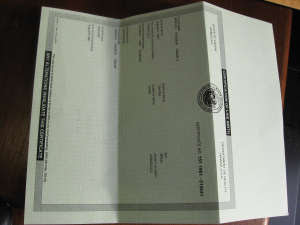 The latest "proof" is the following birth certificate. 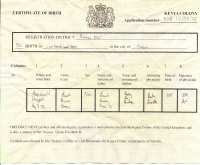 The above purports to be a 1964 certified copy of the original 1961 birth certificate. 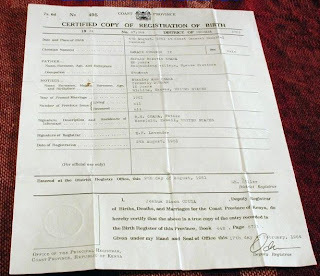 Whether Kenya would spend the resources to recopy all the British birth certificates is open to doubt, but there are two other aspects of this certificate which call its authenticity into doubt. Let us take a closer look at the document. Note that the document number is given as 47,044. Obama is a 47 year old chief executive and 44th president of the United States. A rather amazing coincidence. But the really damning part of the document is this. The location of birth is given as Mombasa. But Mombasa was part of the state of Zanzibar until December of 1963. This certificate is dated February 1964 and carries the name "Republic of Kenya", Kenya did not formally declare itself a Republic until December of 1964. Obama is a rather amazing man to have so many birth certificates! The hoaxers have claimed that this certificate is a fake, but have yet to produce any evidence to back that claim up. Their approach, straight out of the Napoleonic code, is to make continual accusations and demand that the accused prove their innocence. They hope that simply by repeating a claim often enough, useful idiots will come to believe it. But here in the United States, we follow the principle that the ACCUSER must prove the accused guilty, beyond a reasonable doubt. What that means is that when the Swift-Boaters accuse Barack Obama of fraud, it is they who are required to provide proof beyond a reasonable doubt. Otherwise, we as citizens are obligated to ignore such baseless accusations, and certainly refuse to forward them along to everyone in our mailing lists (as these spammed emails always insist we must do). There is more evidence that backs up the Birth Certificate. Hawaii has two major newspapers, the Honolulu Advertiser and the Star Bulletin. 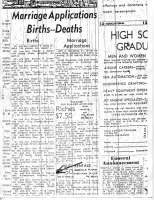 BOTH newspapers include birth announcements, and pages found in the archives of BOTH newspapers record the August 4th, 1961 birth of Barack Obama. Now, McCain's (Rove's) useful idiots will scream that these are also fakes; that they are part of this grand conspiracy by Obama's parents to smuggle a newborn baby from Kenya into Honolulu to obtain a birth certificate and birth announcements. But what is lacking in their story is MOTIVE. It's not like Obama's parents knew back then that Barack would go into politics, and needed to be "Natural Born." Why bother with such a deception, which includes a very risky flight half way around the world with a newborn baby. Finally, the Swift-Boaters hoisted with their own petard with a story carried by World Net Daily, that included the claim "WND has learned that Hawaii's Gov. Linda Lingle has placed the candidate's birth certificate under seal and instructed the state's Department of Health to make sure no one in the press obtains access to the original document under any circumstances." This prompted the following statement from the office of Governor Lingle. Thank you for emailing Governor Linda Lingle's office. A recent article in WorldNetDaily.com (October 26, 2008) claiming that Hawai‘i Governor Linda Lingle sealed Sen. Barack Obama's birth certificate is false. Under Hawai‘i's state law (Hawai‘i Revised Statutes §338-18), copies of vital records may only be released to those who have a tangible relationship to the person whose record is being sought. Neither the Governor's office, nor any other office in the State of Hawai'i, can provide information concerning birth certificates, or produce birth certificates, to anyone except those who are listed in the law governing vital statistics records. (a) To protect the integrity of vital statistics records, to ensure their proper use, and to ensure the efficient and proper administration of the vital statistics system, it shall be unlawful for any person to permit inspection of, or to disclose information contained in vital statistics records, or to copy or issue a copy of all or part of any such record, except as authorized by this part or by rules adopted by the department of health. (13) A person who needs a death certificate for the determination of payments under a credit insurance policy. "The state registrar of the Department of Health's vital statistics record office can verify Sen. Barack Obama's birth certificate." It should be pointed out that contrary to the claims made in some of the spammed emails, Governor Linda Lingle is a REPUBLICAN, not a Democrat. It is difficult to imagine Lingle protecting Obama to the detriment of her own party's candidate. There is, in short, no evidence to support these allegations, and ample evidence to cast doubt on their veracity. If there were anything to this claim that Obama is not legally entitled to be President, don't you think Hillary would have used it to win the nomination, or John McCain to win the election, of Joe Biden even now to become President? Well, for one thing the government and the corporate media are desperate to wreck the credibility of the blogs and alternative media. Therefore, this birth certificate story appears to be is a propaganda operation intended to lure unsuspecting blogs and radio hosts into committing to it, only to have Obama then produce whatever correct documents will prove him a natural-born US citizen. The Kenya birth certificates will be admitted as fakes by their creators, and the corporate media will have a field day bashing the blogs and radio shows that fell for the hoax.